My taco reporting has been less than prolific this year. So, when thinking about naming the 2012 Taco of the Year, I had to look to the past. And the shrimp taco at Mariscos Jalisco immediately came to mind. On a recent trip to the legendary East LA truck I devoured a plate of shrimp tacos and was amazed at how consistently great they have been over the years. The taco hails from the Jalisco town of San Juan de Los Lagos, but it’s a secret recipe. 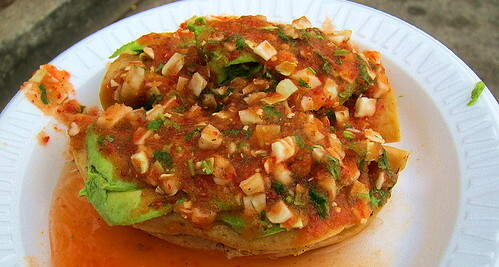 There are some other mariscos trucks in East LA that sell a version of it, but they don’t match up to Mariscos Jalisco. The taco is comprised of a deep fried taco shell filled with shrimp, topped with slices of avocado and then dunked into a delicious tomato broth. It’s hard to explain how good this taco is. Mariscos Jalisco’s shrimp taco is the 2012 Taco of the Year! Looks awesome. Day time or night time? not more popular given that you definitely have the gift. 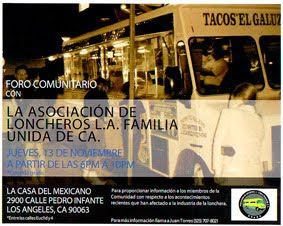 Hey Bandini, give us your wisdom on Tacos Punta Cabras in Santa Monica. Can we get some fish taco love out here on the wasteland of the westside? I'm beginning to think so.Try the scallop taco and the shrimp tostada. Not an advertisement, just a hat tip. Good luck finding a parking spot, but whatever.